Zeelool Summer sale, you can Buy 1 and Get Frames for a 50% off! In looking for an ideal eyeglass frame for the shape of your face, color, and style it must be pleasant and transparent. Now, if you are thinking of buying eyeglass frames online or in a store, check the eye-wear of the leading brands and find the shapes and colors that suits you best. As I have mentioned in my previous post, Zeelool is a dedicated online glass supplier that provides a meticulous and well-crafted eye-wear in different styles, colors, and shapes. As a matter of fact, they try to build a generation of ultra-trendy, professional and cost-efficient prescription eyeglasses. It has a little bit of a wild side. Inspired by Catwoman, this brings you a bold and mystical look. The glasses are suitable for color-changing lenses or polarized lenses. 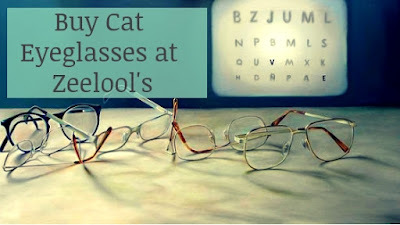 Since we talked about cat eyeglasses, I found two stylish and cute prescription glasses that took my eyes. It comes with a strong and chic frame for women. What I like to see is it features gold-colored metal arms. It looks so fab. Fashionable and cute cat-eye design with a glossy metal frame. It shows you a beautiful charm on the front corners. The best thing about Mary Cute Cat eyeglasses is its anti-allergic and elastic metal arms. It highlights the character with two adjustable nose pads. This is a vintage-inspired eye-wear that merges with contemporary colors and antique finishes. It is made of stainless steel. Simple, yet attractive. The glasses are the symbols of a deep and intricate personality. Whilst, the temple arms with spring hinges for comfort. I know my brother will love this. It is poly-carbonate wrap-around spots sunglasses. Great for outdoor adventures! It has an anti-scratch outer shield that protects detachable prescription lenses underneath. It absolutely provides comfort and secured fit. If you like it, please pin this post.